New York, May 2017: Reuters has announced the launch of Reuters Connect, a content marketplace featuring all of Reuters multimedia content, as well as a diverse array of content from other leading media organizations around the world. 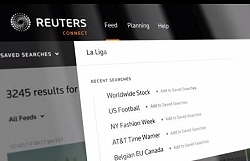 Reuters Connect is designed to be a faster, more intelligent way for Reuters News Agency customers to source all the content they need via a single destination. Content providers on the platform include BBC, USA TODAY Sports, Omnisport (part of Perform Content), Variety, Hollywood TV, Jukin Media, Africa24 and more. Reuters Connect is built to make content discovery quicker and easier, improving clients’ editorial efficiency and enabling them to deliver more stories to their audiences faster than ever before. Reuters Connect is available via subscription and features a new points-based spending model, Reuters Points, which provides clients with the freedom to access and utilize both Reuters and partner content across multiple topics and multimedia formats. Points are available in quarterly allocations so clients can optimize their editorial spend in line with the ebb and flow of the news agenda. Clients can also continue to subscribe to unlimited content consumption. Reuters Connect is now being made available to an initial group of customers, and will be rolled out more broadly in the coming months. For more information about Reuters Connect, visit connect.reuters.com.